Today's article from Picture Correct is by Peter Phun, an adjunct photography instructor at Riverside City College, and it gives some great advice on how to take photographs at night or in low light. Twilight is a magical time. Just because the Sun is down, doesn’t mean you should put away your camera. When the Sun sets, a different looking world exists for photographers. Colors don’t appear the way they do in daylight. Instead, colours display based on your camera’s white balance setting and how that setting matches the various light sources in your scene. Backgrounds become less distracting. Street lights and lit building interiors give you outlines and shapes of various colors. Chances are not everything in your scene is lit. So what you see in your viewfinder is very close to what you’ll get if you expose carefully and properly. People in your scene don’t matter as much unless you want them to. Passers-by don’t register in your image. Even if they do, they are a blur unless you “freeze them” with a flash. Photographs captured in low light conditions, or even in the dark of night, can be powerfully dramatic, sensually moody, or vibrant and glistening with the illumination of stars, streetlamps, or other artificial lighting. But the knack of capturing photographs in low light requires a basic understanding of the way images are captured by the camera. 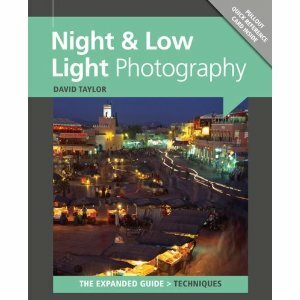 Modern digital SLR cameras are impressively capable of rendering images shot in low light and professional photographer David Taylor discusses, clearly and concisely, the best cameras, lenses, tripods, filters, reflectors, cable releases, flash and other equipment that are essential for this enthralling genre of photography. A detailed, jargon-busting guide to exposure includes information on metering, dynamic range, aperture, depth of field and hyperfocal distance when related to shooting in low light. Getting the best results from your camera also requires an appreciation of the effect of its ISO range and the ability to lessen the obtrusive 'noise' that can detract from a successful image.